You don't have to be a member to book an appointment. Nuffield Health Nutritional Therapy is available to everyone. Buy your Nutritional Therapy package now. We all have unique responses to food, different lifestyles, and unique physiologies to consider. That’s why our therapists are trained to work with you one-to-one, designing a nutritional programme that is specifically tailored to your needs. This will cover nutrition, lifestyle and exercise, where appropriate. 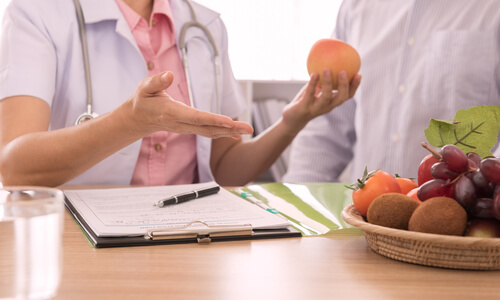 Nuffield Health nutritional therapists are members of both BANT (The British Association for Applied Nutrition and Nutritional Therapy) and CNHC (Complementary and Natural Healthcare Council). They’re highly qualified and experienced in designing and delivering bespoke nutrition plans to support you, whatever your goals. A unique 12-week tailored programme designed to help you reach and maintain your healthy weight. Discover more about the programme today. Find free online advice direct from our experts to help you get to grips with healthier nutrition. Browse our articles here.